THE ICON CONTINUES WITH A ONE-TO-ONE FIT. 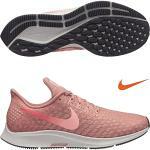 The iconic Men's Nike Air Zoom Pegasus 34 Running Shoe continues with an engineered upper, Zoom Air units and Cushlon foam to deliver responsive cushioning. Dynamic Flywire cables help secure a one-to-one fit so you can go the extra mile in comfort. Premium Cushlon ST foam provides soft and springy yet responsive cushioning with a supportive feel. Rubber crash rail on the lateral outsole acts as a cushioning device at contact for a soft, smooth transition. The rubber is segmented to enhance flexibility. Waffle pistons in the rubber outsole help absorb impact and provide multi-surface traction. Lugs have been turned sideways from the previous version to enhance cushioning.